← God is Searching for Me. Do I want Him to find Me? A few links for your Good Friday meditation. 1. 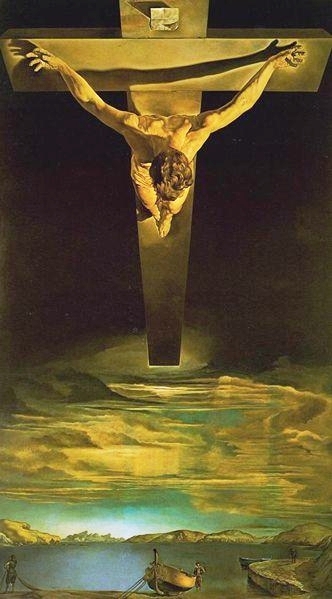 Over at First Things Peter J. Leithart has a beautiful reflection on the Crucifixion. “The cross is the work of the Father, who gave His Son in love for the world; the cross is the work of the Son, who did not cling to equality with God but gave Himself to shameful death; the cross is the work of the Spirit, through whom the Son offers Himself to the Father and who is poured out from the pierced side of the glorified Son. The cross displays the height and the depth and the breadth of eternal Triune love. The cross is the wooden ark of Noah, the refuge for all the creatures of the earth, the guarantee of a new covenant of peace and the restoration of Adam. The cross is the ark that carries Jesus, the greater Noah, with all His house, through the deluge and baptism of death to the safety of a new creation.” Continue reading this beautiful reflection here. 2. The Vatican has The Way of The Cross with meditations from Sr. Maria Rita Piccione O.S.A. The Pope read her meditations when he led the stations at the Colosseum. Finally here is a video from the last nine minutes of The Passion of the Christ. H/T Deacon Greg. This entry was posted in Jesus Christ, Liturgical Year and tagged Good Friday, The Crucifixion, The Passion of Christ. Bookmark the permalink.